Easy shrimp stir-fry recipe ready in 30 minutes or less! Tender pieces of succulent shrimp, crunchy snow peas, and red bell peppers tossed in a sweet and savory orange sauce with a hint of spiciness! 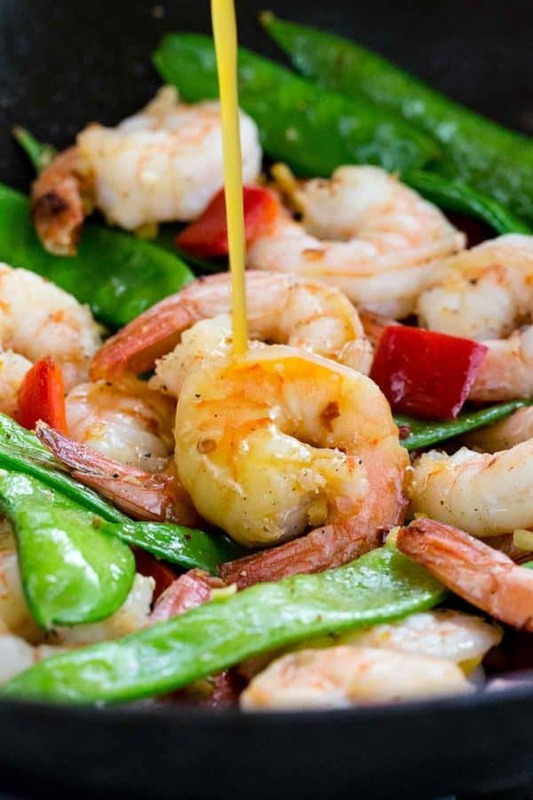 An easy weeknight meal can be prepared in one pan with this shrimp stir-fry recipe! The tool of choice is a wok, cooking each ingredient quickly and adding extra flavor to the shrimp while retaining the crunchy textures of each vegetable. Using a wok requires very little oil, just enough to coat the surface of the pan so the ingredients don’t stick, making the meal low in fat. This efficient cooking tool also allows more nutrients to be retained. Every good stir-fry needs a delicious sauce. I’ve created a naturally sweetened and tangy orange sauce that has a little kick of heat. It’s a lighter consistency that perfectly coats the shrimp so that each bite gets a bright citrus flavor. Grab your wok, it’s time to turn up the heat! There’s an essential cooking method to stir-frying that ensures seafood and vegetables have a desirable taste and texture. Don’t worry, it’s easy to do! The most important thing to remember is for the wok to work properly, it needs to be very hot and the ingredients should be cooked one layer at a time. This is a saute method, so we need maximum heat transfer for browning and to prevent steaming in the pan. I love that shrimp is a very lean source of protein and that cooks in just a few minutes. It’s also visually very easy to see when they’re done. You want the colors to go from a grey-translucent appearance to one that’s pink and opaque. Beware, shrimp can turn rubbery when overcooked! Make sure it slightly curls into a “C” shape, and not a light “O”. 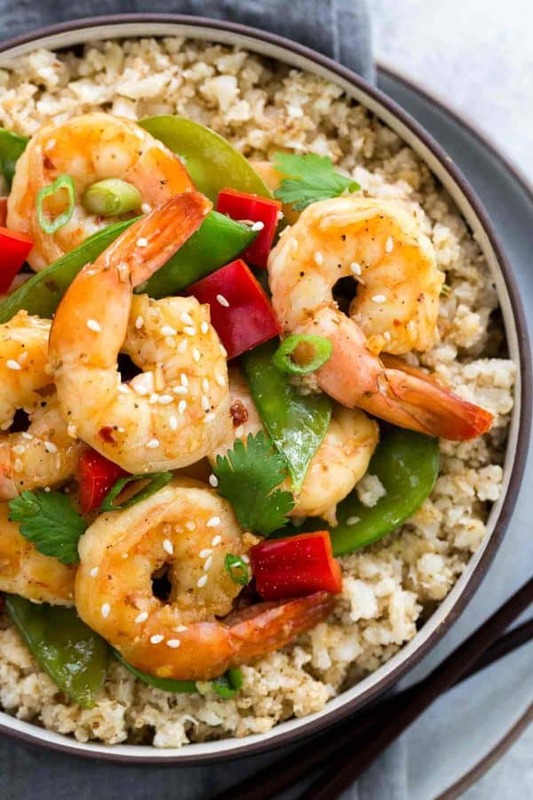 When stir-frying we prevent this from happening by searing the shrimp on each side to lightly brown and cook the protein but halt the cooking process by transferring it to a plate as we cook the other ingredients. It’s time to make the sauce! I’ve always found that citrus and seafood pair nicely together. The sauce is a simple combination of freshly squeezed orange juice, vegetable broth, soy sauce, red chili flakes, and cornstarch. I also added some apple cider vinegar, it’s my secret ingredient to instantly boost the orange notes in the sauce while balancing the sweet and savory flavors. I always keep different types of vinegar handy in my pantry because there are so many versatile uses. Raw and unfiltered apple cider vinegar naturally add acidity to recipes, providing brightness and a new dimension of taste to any dish. The last step of cooking stir-fry is to thicken the sauce mixture in the wok. Once the orange sauce ingredients are whisked together, they are added to the shrimp mixture to warm. A cornstarch slurry is then added to the hot pan, which will add volume to the sauce in under a minute! The sauce becomes a golden orange glaze, delicately coating everything in the pan. The combination of flavors and textures is irresistible! I often serve this shrimp stir-fry with brown rice, or for a low-carb option, try sauteed cauliflower rice. The rice absorbs some of the fragrant orange sauce, making each bite even tastier! When stir-frying delicate aromatics in a wok, it’s best to add them towards the end of cooking instead of right at the beginning. The surface of the wok is extremely hot, so the small minced pieces of garlic and ginger can easily burn within seconds, creating bitter flavors. To prevent this, the vegetables are cooked first, once the pan slightly lowers in temperature, and then the aromatics. This helps prolong the aromas and keeps the flavors unharmed. In a medium-sized bowl whisk together orange juice, vegetable broth, soy sauce, apple cider vinegar, and red chili flakes. Pat dry shrimp in between two paper towels to remove as much moisture as possible. Season both sides with salt and pepper. Heat a wok or 12-inch saute pan over high heat. Add vegetable oil and sesame oil and heat until just smoking. Add shrimp to the pan in a single layer and cook 1 minute. Flip shrimp over and cook until no longer translucent, about 1 minute. Transfer shrimp to a clean plate. Add bell pepper and snow peas to the wok in a single layer, allow to cook for 1 minute without moving. Stir vegetables and cook until lightly browned and crisp, about 30 seconds. Add garlic and ginger to the pan, stir-fry until fragrant, about 30 seconds. Add shrimp back to the pan and stir to combine. Add the orange sauce to the pan, stirring to warm, about 2 minutes. Whisk the cornstarch and water mixture, and then add to the center of the wok. Stirring continuously until the sauce has thickened, about 1 minute. Season the shrimp stir-fry with salt and pepper as desired. Garnish with green onions, sesame seeds, and cilantro. MAKE IT WHOLE30: Use coconut aminos instead of soy sauce, use arrowroot powder instead of cornstarch, use extra-virgin olive oil, ghee, or coconut oil instead of vegetable oil, and use sea salt instead of kosher salt. MAKE IT GLUTEN-FREE: Use coconut aminos or tamari instead of soy sauce. MAKE IT PALEO: Use coconut aminos instead of soy sauce, use arrowroot powder instead of cornstarch. I made a shrimp stir fry with asparagus on Saturday and I was wondering at what point to add the ginger and garlic. I was very glad to find the information from you here. I have enough shrimp left to try your recipe here. I have made the Easy Shrimp Stir Fry twice. It’s a keeper!! Second time, I added some pineapple chunks. Whoo hoo! I love the addition of the pineapples, I will give it a try. Thanks Ken! Accidentally bought sugar snap peas instead. Added sliced mushrooms. Didn’t have enough OJ left after the family got to it, so only was able to use about a fourth cup. But this was so good! I will make it again and again. My daughter wants me to try it with chicken. Thank you! Thank you for your feedback Delisa! Good idea making it with chicken next time. Made this last night. Under the Ingredients it lists 1 tsp sesame oil but the Instructions never say when to add the sesame oil. Is it to be added in the orange sauce? Hi Mary- Just updated the recipe to have the sesame oil with the vegetable oil for stir-frying. Thanks!